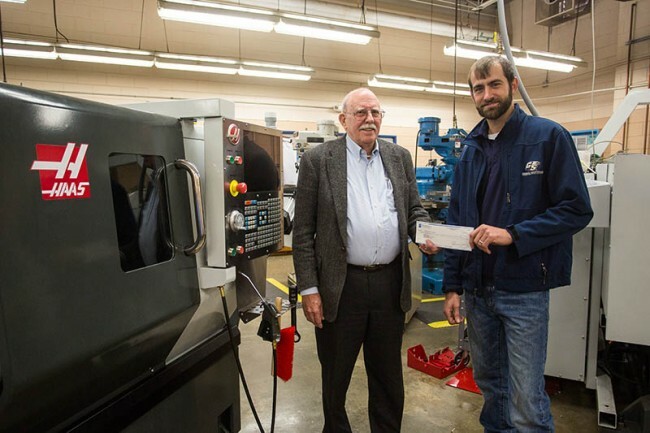 The Manufacturing Engineering Program at Georgia Southern University has received a grant from the Gene Haas Foundation that will provide scholarships for students majoring in the program area. The Gene Haas Foundation awarded a $15,000 grant to the Program to provide financial assistance to students who plan to pursue a career in the manufacturing field. The program has yet to determine how many scholarships the funds will create, but is grateful to have the support of Gene Haas as it prepares its students. The Manufacturing Engineering Program at Georgia Southern officially began in August 2015 and is housed in the Allen E. Paulson College of Engineering and Information Technology (CEIT). Georgia Southern is the only university in the state of Georgia to offer a Bachelor of Science degree in manufacturing engineering, and similarly the only university in the southeastern United States to offer a manufacturing engineering undergraduate degree. Currently, there are only 21 accredited undergraduate manufacturing engineering programs in the U.S.
“This donation is reassuring and it’s a step in the right direction that shows there is still interest from the [manufacturing] sector in manufacturing engineering education,” said Spencer Harp, laboratory supervisor in CEIT who applied for the grant. The Gene Haas Foundation was created by its namesake, Gene Haas, the owner of California-based Haas Automation and co-owner of Stewart-Haas Racing. Haas began this foundation in 1999 to fund the needs of the local community and other deserving charities. His commitment to the importance of manufacturing in the United States incited him to grow his personal foundation and direct his foundation board to focus on manufacturing education and grants for scholarships for students entering the field.